Before it was the BPost Bank Trofee it was known as the Gazet Van Antwerpen Trofee or the GVA Trofee. And the GVA Trofee race in Baal, Belgium, has been the Grand Prix Sven Nys since 2000. In the 16 editions of the race, Nys won “his” race a dozen times. The 2006 edition epitomized what many think of when they think cyclocross: cold, wet and muddy. Nys was racing in the rainbow jersey as the reigning World Champion. The powerful Rabobank squad, and Nys in particular, dictated affairs as riders slid about in mud-covered kits with obscured sponsor names. 2006 was not a year that Nys took the top spot, although he animated the race seemingly from the start and finished second ahead of 20-year-old countryman Niels Albert (Palmans Sapim Collstrop) who was third. It was Nys’ Rabobank teammate Dutchman Lars Boom who took the win. 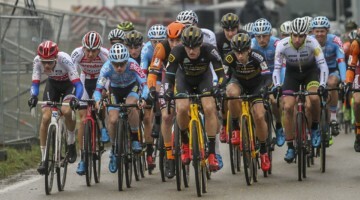 We’ve heard that Boom may return to ‘cross and to Nys’ Telenet-Fidea team, but those rumors have subsided in the excitement of Lars van der Haar’s move to the legend’s squad. Still, one can hope to see the old teammates join forces again. Enjoy the race replay of the 2006 GVA Trofee Baal – GP Sven Nys. The full race video was posted to You Tube by Wesley VDB just last week. 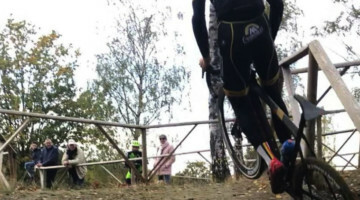 cyclocross sven_nys Opening Baal Jr clip: BjornSelander riding to 4th. DannySummerhill 5th. 3 weeks later: Bjorn 7th at Worlds Zeddam! CrossSportif cyclocross sven_nys BjornSelander DannySummerhill Lets get Bjorn back on a CX bike! Kid has skills and an engine!